Car seat safety is a very important topic, and one that the majority of parents pay close attention to. We’ve come a really long way since the days of our childhoods, when car seats were sort of an afterthought, or worse, so poorly designed that they made riding in a car MORE dangerous. Today’s car seats are engineering marvels, with so many layers that are all designed to come together to keep our children as safe as possible in the event of a car accident. The American Academy of Pediatrics recently released an updated version of its car seat safety recommendations. Car seat safety can sometimes feel overwhelming (especially for first-time parents), but when we break it down, it gets really simple. The American Academy of Pediatrics recently updated its car seat recommendations to remove the reference to a specific age (2 years) for turning kids around. Now the AAP suggests parents keep them rear-facing until they outgrow their car seat’s height and weight limits. For a lot of kids, this means they’ll be rear facing until they’re 3 or 4 years old.. Most convertible car seats have a weight limit of between 35 and 50 pounds, so kids can be pretty old before they turn around. Car seats can be tricky. Every seat is different and every car is different. That’s why it’s so important that parents take the time to read the manual and even seek help from a car seat installation specialist if needed. According to the AAP, one study found that 95% of car seats were misused by parents taking newborns home from the hospital, and 20% of booster seats were being used incorrectly. Ask the hospital staff for help if you’re unsure about your car seat when taking your newborn home for the first time. 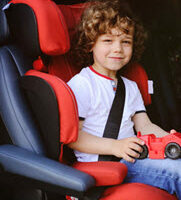 It’s not just the use of rear-facing seats the AAP wants parents to extend, but also the use of car seats in general. Once your child outgrows the rear-facing limits of their car seat, keep them in a forward-facing car safety seat with a harness for as long as you can.Many modern car seats have weight limits of 65 pounds or more, so kids can stay in them for quite some time. The AAP says that when kids finally do max out that 65 pound or so weight limit on their forward facing seats, they should move into a belt-positioning booster seat until the vehicle belt fits properly. “This is often when they have reached at least 4 feet 9 inches in height and are 8 to 12 years old,”the AAP notes. Your middle-schooler may not be thrilled about riding in a booster, but it is the safest bet until they truly grow into the adult seatbelt. The AAP says kids under 13 should always ride in the backseat. The Centers for Disease Control and the National Highway Traffic Safety Administration agree. Many states have laws requiring children to be seated in the back seat (although in some cases exceptions are made if the back seat is already full of children or if the vehicle has no back seat). Statistically, the back seat is the safest place to be in a collision, so our kids should stay back there for as long as possible.